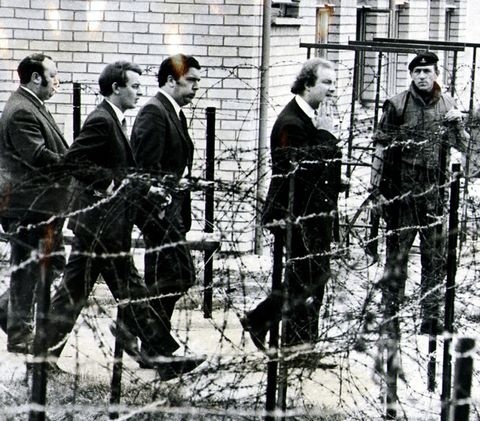 John Hume and Paddy Devlin, both members of the Social Democratic and Labour Party (SDLP), held a meeting with representatives of the Irish Republican Army (IRA) in Derry. At that meeting the IRA representatives outlined their conditions for talks with the British Government. The conditions were that: there should be no restriction on who represented the IRA; there should be an independent witness at the meeting; the meeting should not be held at Stormont; and ‘political status’ should be granted to republican prisoners. James Callaghan, then shadow Foreign Secretary, speaking in the House of Commons, said that Britain might reconsider its position with regard to Northern Ireland if the Assembly was ‘sabotaged’. Merlyn Rees, then Secretary of Sate for Northern Ireland, gave details in the House of Commons of a committee which had been set up to see how the Royal Ulster Constabulary (RUC) could be more effective in enforcing law and order in Northern Ireland. The election to the European Parliament took place in Northern Ireland with the whole region treated as a single constituency under a system of proportional representation. The Irish Republican Army (IRA) exploded a large bomb, estimated at 1,000 pounds, in the centre of Belfast. The Home Office in London announced that there were irregularities in the forensic evidence that led to the convictions of the Maguire family. The Irish Times (a Dublin based newspaper) carried a report of an interview with Gerry Adams, then President of Sinn Féin (SF). The Northern Ireland Forum met for the first time in Belfast. Sinn Féin was excluded because of the absence of an Irish Republican Army (IRA) ceasefire. There are objections by the Democratic Unionist Party (DUP) and the United Kingdom Unionists (UKU) to the appointment of John Gorman, a Catholic Ulster Unionist Party (UUP) delegate, to the chair of the Forum. A Protestant family living in a stately home on the outskirts of Derry suffered a third petrol bomb attack. It was believed that Nationalist living in a nearby housing estate were responsible for the attacks. Two men escaped injury when shots were fired at then in Sandy Row, south Belfast. The Progressive Unionist Party (PUP) later stated that “it is more that likely that UVF personnel carried this [attack] out”. Counting was completed and the result of the European election was announced. The Methodist Church called for direct talks between the Orange Order and the Garvaghy Road Residents’ Coalition (GRRC). Shot from passing car while walking along Divis Street, Belfast. Security man. Shot outside Garden Bar, Meadow Street, Tiger’s Bay, Belfast.